GOLDEN APES is a quintuple of musicians from Berlin which have combined the best features of 80s post-punk: the velvet vocal of Nick Cave, forcefulness of early Psychedelic Furs, renowned melancholy and depression of the Cure, claustrophobia and isolation of the Joy Division and added gothic inflections of the Fields of the Nephilim and the Sisters Of Mercy. 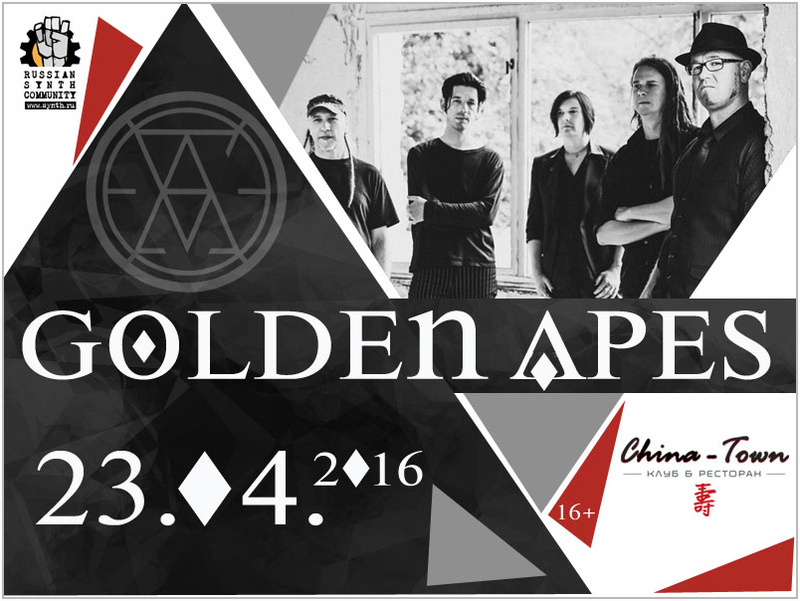 During almost 20 years Golden Apes released six LP albums and played at an enormous amount of thematic festivals. They shared the stage with Clan Of Xymox, Ikon, Zeraphine and the legends of the British post-punk And Also the Trees and trendy She Past Away. They have become friends with the latest owing to common views on music after few joint shows in Germany with both bands having equal response from the audience. A curious biographical fact which must be revealed is the collaboration of the vocalist Peer Lebrecht in The Dust of Basement. His lyrics and distinguished vocal is a part of the beauty of the two latest albums of this cult European underground project. The vast anthology of the Golden Apes «Des Dossiers de Mémoire» was published last year. A new album’s release is planned for this year, some songs from which might be presented during the forthcoming Russian shows. The event happening on 23rd of April in China-Town is a must for all fans of post-punk esthetics, chilly darkwave sound and the real classic gothic-rock! Filigree acoustic patterns, guitar drive and the above mentioned simplicity combined with furious rage, renowned deep vocal a-la Nick Cave and atmosphere of the early the Cure and Joy Division – this is a very brief and approximate description of the unique sound collage of the Golden Apes which only live reveals itself at its maximum. Therefore the most right decision is to come and hear it! And this is a very easy thing to do due to tickets’ special anti-crisis price and the venue’s «China-Town» convenient location (2 minutes from metro Kitay Gorod).